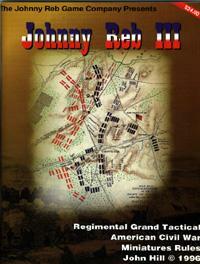 Doug Kline, the owner of the Johnny Reb Gaming Company, recently published an official document rewriting and clarifying some of the most misinterpreted rules for John Hill’s classic Johnny Reb 3. Several members of the JRIII Yahoo Group collaborated on this effort. We at the Johnny Reb Gaming Society have received written permission from Doug to reproduce this document on this blogspace for folks who may not have access to the JRIII Yahoo Group’s file archives. Here is Doug and his team’s excellent work… this is a rather large file, with some excellent graphics from Scot Gore, so please be patient. The JRGS salutes al lthe people on the JRIII Yahoo Group who contributed to this long overdue effort!